There are a lot of discussions ongoing about clinical pathways (also known as care pathways and integrated care pathways) and what to consider when producing them. Clinical pathways are evidence-based roadmaps that assist in reducing variations in clinical practice (Hipp et al., 2016). The pathways act as some of the most important tools in maintaining high quality of healthcare when it comes to the standardization of care processes. Baseline and mapping: are there standardized care pathways for certain patient groups already in place? How effectively are the pathways executed? Is the baseline data collected at the beginning of the pilot project? What are the variables that are to be improved? At first, everyone should analyze where we are at, why improvements are needed and what needs to be achieved. Interdisciplinary teams: since various healthcare professionals take care of the patient during the care path, the medical staff should contribute to creating a consistent workflow. Process leaning: what inconsistencies, unnecessary steps or other poor allocation of resources have been discovered in the care path? Knowing this, we can develop key performance indicators that will help us. Piloting: compare the baseline data about the patient to the data collected during the pilot phase. For example, how long did the patient spend at each stage of the treatment process, and how has this changed after the beginning of the pilot project? Variance analysis can be used as a tool. How do the results deviate from the expected care path and why? Based on the analysis, we can make further improvement plans. Go / No Go: were the results satisfactory, or is there room for more improvements? There is not much literature on how to develop successful care pathways at the moment, but, for example, Great Ormond Street Hospital for Children in the UK talks about similar phases. These are the principles we found that work. Hospitals use our BuddyCare solution to make care paths mobile for patients. 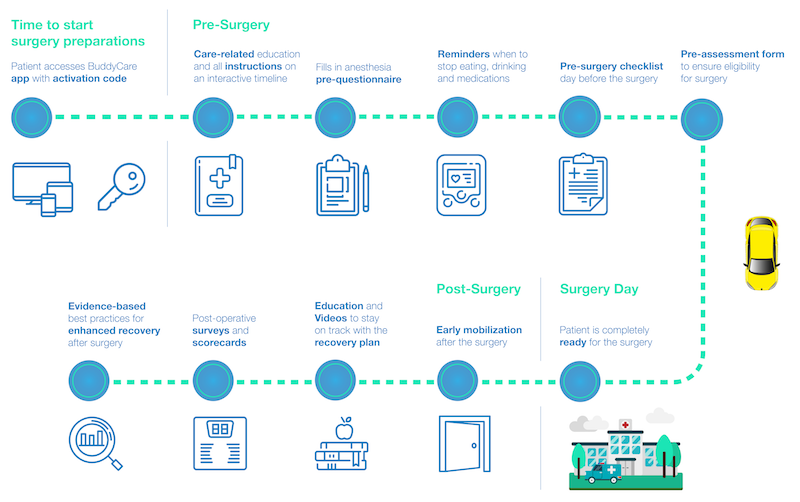 This has enabled us to gather data on how patients stay on track on the care path, acknowledge instructions and carry out other important tasks during the pre- and post-operative phases and, thus, make improvements based on the collected information. If you wish to find out more about our solution, please read the previous posts, leave a comment below and get in touch. Thanks for reading and until next time!